UP BTC Enrollment Number can be downloading or login from 16 September to 22 September 2018. 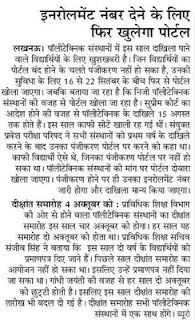 There is good news for Students who have taken admission in UP Polytechnic Institute. The relaxation will be adjusted to those student who unable to make registration while filling UP BTE Online 2018-19. 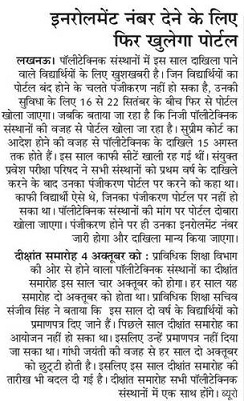 UP Polytechnic Enrollment Number Link :- To get Enrollment Number of Left candidates portal will be opened from 16th September 2018. This suggestion given by Private Polytechnic institute who are facing less number of UP Polytechnic Institute. Students From all branches Civil, Electrical, Mechanical, Electronics and Automobiles etc trade wise option available under UP Polytechnic Enrollment Numbers. We already know railway has promise to give jobs more than 1 Lakh and every year minimum 30,000 Railway employee retired. So to focus on Career in Railway after 12th Pass. Indian Students now moving to opt course of diploma level of 1 year, 2 years or 3 years. If we compare to B.tech degree 40% students were vacant and some candidates who locked their seats they don’t come to know the status of seats. Board of Combined Entrance Exam directed to all Polytechnic holders on adding students name list who come after completing 1 years of Polytechnic course. Date:- 16 to 22 September 2018. Note:- Many students complaint about not seeing their registration number on portal. How to check status of BTE UP Enrollment number:- After Registration students Enrollment will be visible and they get the eligibly as Polytechnic Students.